Obviously, the big story is Larry Page replacing Eric Schmidt as CEO. That news is so big it even dwarfs Google’s huge Q4 of 2010, in which the company reported $8.44 billion in revenue — a 26 percent increase over 2009 and 17 percent increase over the $7.2 billion earned in Q3. Profit grew 29 percent to $2.54 billion, compared to $1.97 billion in Q4 2009. 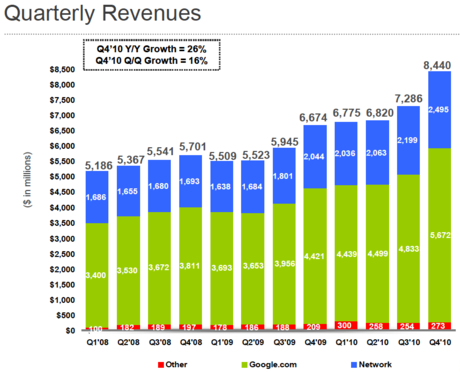 Google-owned sites generated revenues of $5.67 billion (67 percent of total revenues), a 28 percent increase over Q4 2009 revenues of $4.42 billion. Google’s partner sites generated revenues, through AdSense programs, of $2.5 billion (30 percent of total revenues), a 22 percent increase from Q4 2009 network revenues of $2.04 billion. Revenues from outside of the United States totaled $4.38 billion, (52 percent of total revenues) compared to 52 percent in Q3 and 53 percent in Q4 2009. U.K. revenues totaled $878 million (10 percent of revenues), compared to 12 percent in Q4 2009. Aggregate paid clicks, which includes clicks related to ads served on Google sites and the sites of Google’s AdSense partners, increased about 18 percent over Q4 2009 and 11 percent over the Q3 2010. Average cost-per-click, which includes clicks related to ads served on Google sites and the sites of Google AdSense partners, increased approximately 5% over Q4 2009 and increased about 4 percent over the Q3 2010. Worldwide, Google employed 24,400 full-time employees as of Dec. 31, 2010, up from 23,331 full-time employees as of Sept. 30, 2010.